Camshaft sprocket timing pin x 2 – Peugeot No.(-).0198.B2. Crankshaft holding/turning tool – Peugeot No.(-).0198.2.A. Crankshaft timing pin – Peugeot No.(-).0198.A. Tensioner locking pin – Peugeot No.(-).0198.J. Fit camshaft sprocket timing pin  . Insert tensioner locking pin  . Camshaft sprocket timing pin  . Ensure crankshaft timing pin inserted  . Align black coloured chain links with timing mark on each sprocket  &  . 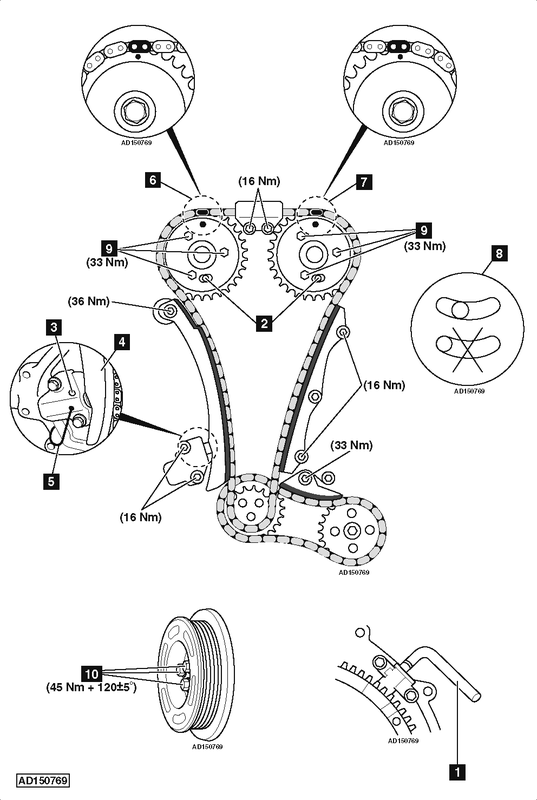 Fit timing chain and crankshaft sprockets. Finger tighten bolts. Ensure camshaft sprockets turn freely but do not tilt. Remove tensioner locking pin  . Ensure bolts of camshaft sprockets not at end of slotted holes  . Tighten bolts of each camshaft sprocket  . Tightening torque: 33 Nm. Remove crankshaft timing pin and camshaft sprocket timing pins  &  . Coat crankshaft pulley bolts  with suitable thread locking compound. Tighten crankshaft pulley bolts  . Tightening torque: 45 Nm + 120±5°.